This web site is provided as a courtesy of Vision Data Equipment Corporation. While we have endeavored to provide helpful information, nothing herein is intended as an offer for sale, representation, or warranty. The information on this web site is provided "as is," without warranty of any kind, either express or implied, including, but not limited to, the implied warranties of merchantability, fitness for a particular purpose, or non-infringement. Some jurisdictions do not allow the exclusion of implied warranties, so that particular exclusion may not apply to you. In no event shall Vision Data Equipment Corporation be liable for any damages whatsoever, including, without limitation, special, indirect, consequential, or incidental damages, or damages for lost profits, loss of revenue, or loss of use, arising out of or related to the use or reliance on this web site or the information contained in it. This shall apply whether such damages arise (or are alleged to arise) in contract, negligence, tort, under statute, in equity, at law or otherwise. Vision Data Equipment Corporation shall not be liable for any errors or omissions contained on this web site, and reserves the right to make changes without notice. Again, all information is provided "AS IS." Vision Data Equipment Corporation makes no representations whatsoever about any other web site which you may access through this one. 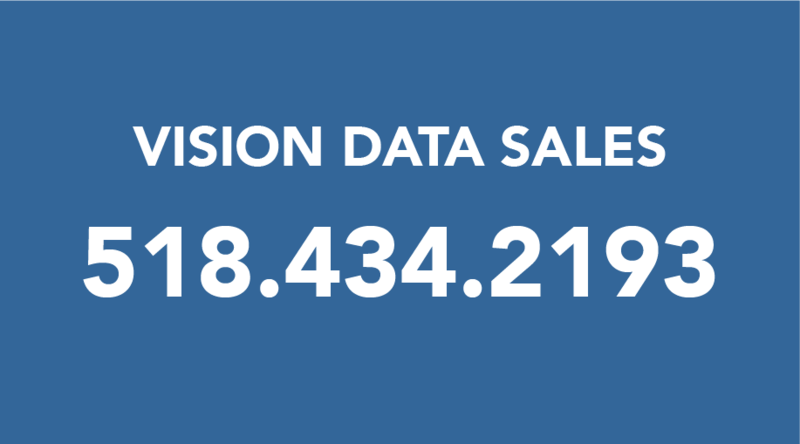 When you access a non-Vision Data Equipment Corporation site, please understand that it is independent from Vision Data Equipment Corporation, and that Vision Data Equipment Corporation has no control over the content on that web site. In addition, a link to a non- Vision Data Equipment Corporation web site does not mean that Vision Data Equipment Corporation endorses or accepts any responsibility for the content, or the use, of such web site. This web site, including layout and graphics, is a copyrighted work and is protected by worldwide copyright laws and treaties. You may not repost or reproduce this work, prepare derivative works based on this work, distribute copies of this work to the public by sale or other transfer of ownership, or by rental, lease or lending, perform or display this work publicly, or otherwise commercially exploit this work. However, you may view, download, and reprint copies of the work provided that (a) a notice in the form "Copyright © 2018 Vision Data Equipment Corporation. All rights reserved." appears in all copies, (b) use of copies is for informational, noncommercial, and personal use only and is not be copied or posted on any network computer or broadcast in any media, (c) no modifications are made to the copied work. If you wish to make more extensive or other uses of this work (or portions thereof), you must have our express written permission. Please contact Vision Data Equipment Corporation if you wish to pursue this further. Note that any product, process, or technology described on this web site may be the subject of other Intellectual Property rights reserved by Vision Data Equipment Corporation and are not licensed hereunder. Except as expressly provided herein, Vision Data Equipment Corporation does not grant to you by virtue of this web site or the statements contained herein any express or implied right under any of those Intellectual Property rights.